The Milestone blog is a place for seniors, family members, and caregivers to get information about senior living as well as tips for living a well-rounded life into old age. Click the categories below to browse our resources. Do you feel that? The weather is heating up and the flowers are getting ready to bloom. Indeed, spring is about to be sprung! As winter's grasp is finally loosened, Americans around the country are ready to stretch their legs and enjoy the warmer temperatures. The same rings true for seniors, whom the winter often affects more than others (like fall risks associated with ice, or the seasonal flu that can become a serious illness). And just like everybody else, seniors are raring to get active. There's no better way to take advantage of the change of season than with a ritual spring cleaning. Even if seniors don't live in a big house anymore, there's still ample opportunity to spruce up their residences and communities to usher in the rebirth of spring and get some practical to-do items checked off. Here are some tips on how seniors (and even all of us!) can use spring cleaning to reduce clutter, make goals for the rest of the year to come, and downsize in retirement. Seniors can make spring cleaning feel like less of a chore and more of a fun activity when they invite family members or friends to assist in the tradition. Not only will some added help make the process more fun, but also easier. The more people at work, the faster things will go. While inviting a family or friend isn't required, seniors should certainly give some thought to it for a couple reasons. One, able-bodied help can move heavy furniture that can be tough to wrangle; and two, taking a trip down memory lane as you dust off old photographs and the like can be an enjoyable moment for all involved. 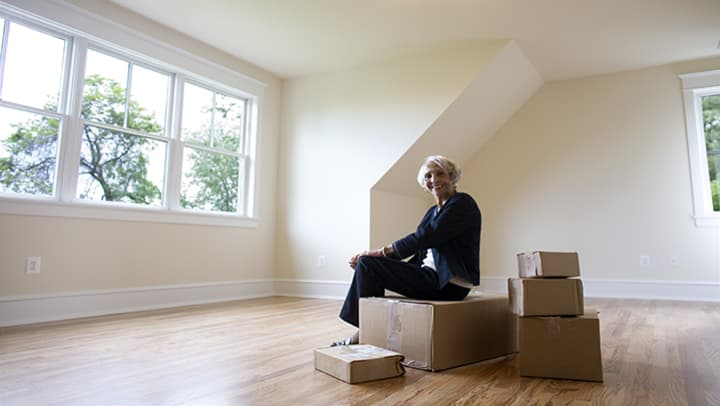 Nobody ever really wants to throw anything out, but the reality is seniors living in a retirement community only have so much space in their residence, and pack-rat habits that may have worked in a house just don't make sense in retirement. During spring cleaning, seniors should make it a point to reduce the clutter if for no other reason than piles of keepsakes and junk may present a physical risk in the apartment. That doesn't mean valuable memorabilia or items with sentimental value have to go, just that something else has to. Seniors should also keep in mind that they don't have to trash the things they need to get rid of, like old clothes, books, movies and such. Indeed, donating items to charity can at once both help seniors feel better about getting rid of stuff they've held onto for years, as well as allow them to do good for their greater community. While spring cleaning can have an improvisational feel, everything goes more smoothly if there's a list of things to accomplish, or a set way to organize the day. If seniors really want to make the most of spring cleaning, they can create a checklist with sub-lists for each room they have in their residence, or group tasks that are related to one another. For instance, save the deep clean for last after everything else has been taken care of so seniors don't end having to wipe down their residence twice. Spring cleaning gives seniors the chance to shake the cold from their bones and get moving as soon as the warm weather and season allow. Living such an independent and active lifestyle is crucial to happiness in retirement. Have more questions? Don't hesitate to give us a call. We're happy to help.